Sushi Oyama use to be a heritage house before it was converted into a restaurant. Sushi Oyama is a Korean run Japanese restaurant that is most famed for their specialty rolls such as the Las Vegas Roll, cream cheese roll, sushi pizza, and dynamite rolls! I've tried a lot of Tempura, and I have to say, this ranks up there as one of the best I've ever had! The exterior shell had an satisfying crunch to it, and wasn't too thick as to distract from the yam and prawn itself. The batter was very fragrant and flavourful, and the vegetables weren't soggy. This was the first dish to come out and served as a great first impression. Cheese in sushi. I wasn't sure what to expect, but since it was one of the cheapest specialty sushi rolls on the menu, I decided to give it a try. 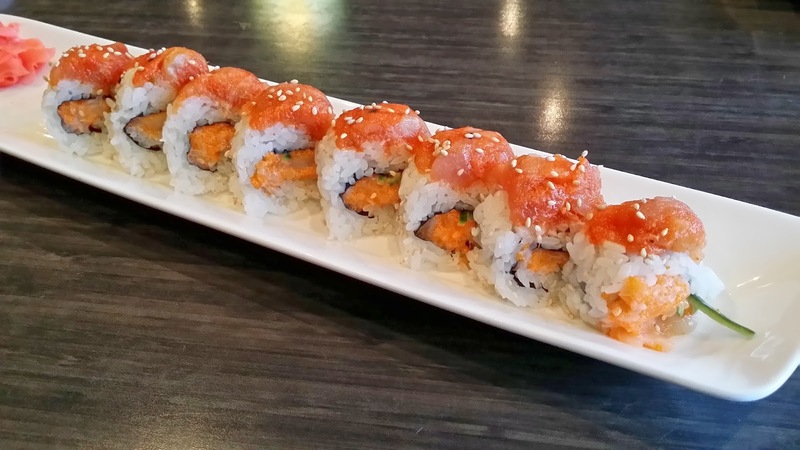 The roll consists of cream cheese, red pepper, mango, imitation crab meat and mayo, topped with smoked salmon. The flavours infused together perfectly, and the cream cheese was definitely very prominent. I've also noticed that they use sour Japanese rice in their sushi rolls, as opposed to Chinese rice that is usually used by non-Japanese sushi establishments. I'm not a huge fan of imitation crab meat, but I really enjoyed this roll! This roll is one of the pricier ones on the menu, but for good reason! A lot of reviews mentioned that this roll was delectable, and they weren't wrong! The exterior of the Las Vegas Roll is deep fried and consists of five kinds of sauces with cream cheese, spicy salmon, imitation crab,cucumber, masago and is topped with bonito flakes and mayo. The main filler in this roll is the imitation crab, however the taste isn't detectable because it's covered by erroneous amounts of sauce. I personally thought that the bonito flakes distracted from the already great tasting combination of flavours, however I understand that it's mainly for aesthetic reasons. 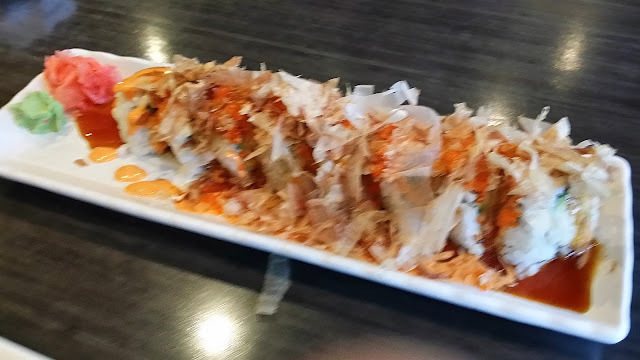 The red roll is basically a spicy scallop roll consisting of chopped scallop, mayo, and cucumber topped with spicy tuna and mayo. The salmon tasted fairly fresh and melted in your mouth. The scallop had a subtle spiciness to it. I really appreciated the simplicity of this roll and it was a nice way to clear my palate. This and the cheese roll were the only rolls served cold. The others were all served above room temperature. 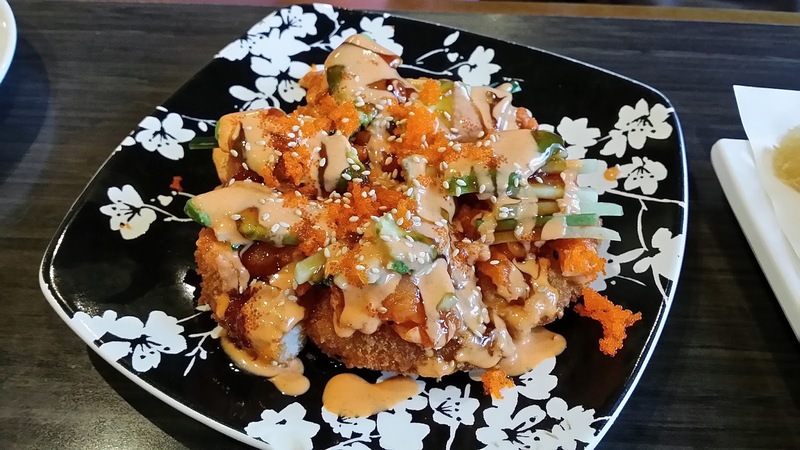 This sushi pizza is actually made out of deep fried rice, topped with spicy tuna, salmon, cucumber, avocado, masago and mayo. This was surprisingly great! The exterior of the fried rice was very reminiscent of fried crab cakes and katsu! I'm guessing they use the same batter. The toppings infused together very well, making for a very savoury tasting pizza that is sweet, spicy, crunchy, and soft all at the same time! 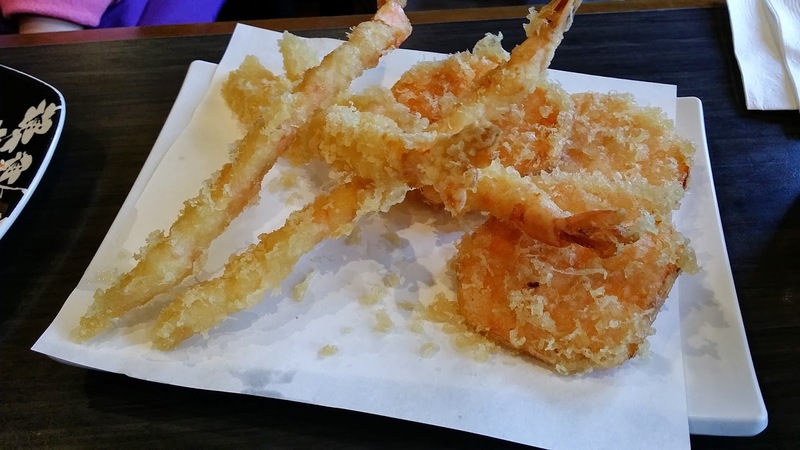 On another occasion I also got the Yam & Prawn tempura, which were excellent, like the first time! Contrary to it's name, I didn't find this roll awesome haha.In comparison to the other rolls, the mediocrity of this roll was overwhelming. This roll is comprised of crab, cucumber, cooked salmon, masago, green onion, avocado, topped with mayo and a abundance of bonito flakes. The flavours didn't compliment each other and just tasted very odd.